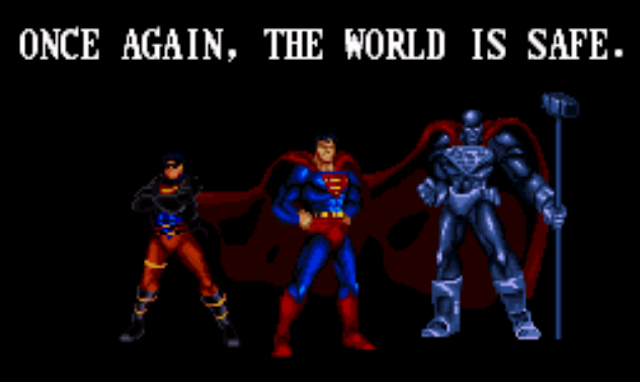 It's been a good summer for the 1992 Death and Return of Superman story line, with DC reprinting all four collected editions of the story and various Reign on the Supermen! characters appearing in DC Rebirth titles. This has renewed my interest in the entire epic 90's comic event — which, as I mentioned in a previous post, was the death knell of my hard-core comic book collecting days (having felt that everything 'had been done' after the resolution of that event and nothing would ever surprise me again). I have a very vague memory of the Death of Superman, Funeral for a Friend, Reign of the Supermen! 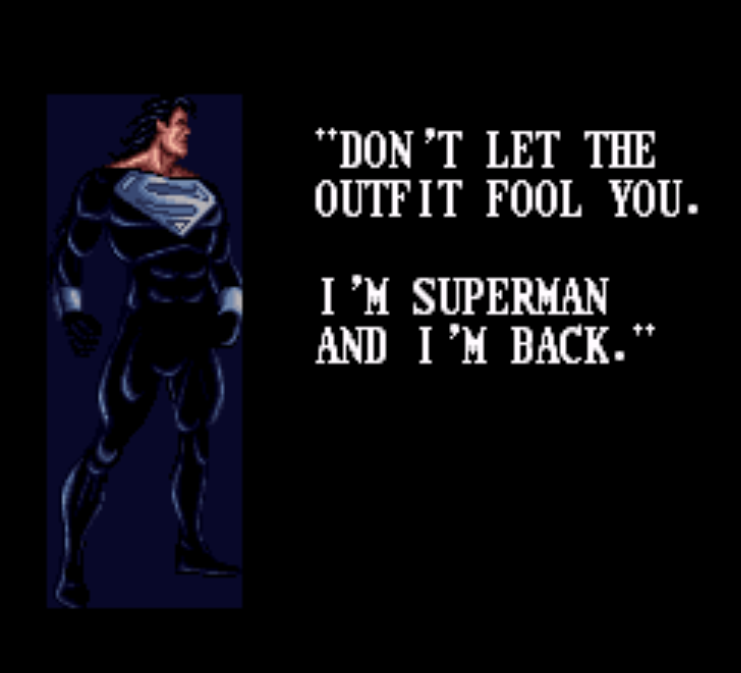 and The Return of Superman story lines. I mean, I get the overall gist of it — but some of the minutiae details are lost on me. 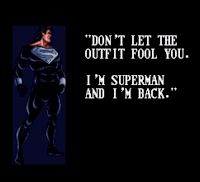 Keeping that in mind, I thought it would be the perfect opportunity to revisit 1994's The Death and Return of Superman game from Sunsoft, Inc released for the Super Nintendo AND Sega Genesis. I'll be playing the SNES version and I'll be reviewing this game as a comic book fan and a gamer. The Death and Return of Superman console game was advertised in the summer of 1994, well after the entire comic book story line had resolved itself. (So, there were no major spoilers in this game.) 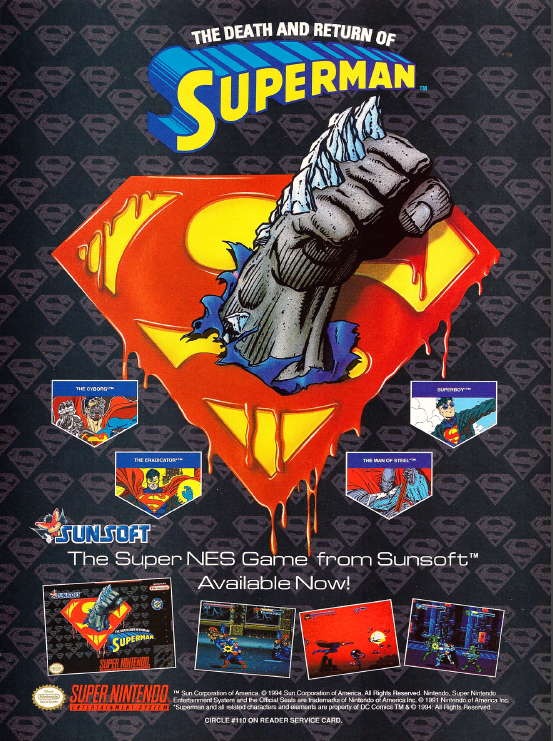 This game was sandwiched between the releases of Capcom's Super Street Fighter II: The New Challengers and Acclaim's Spider and Venom: Maximum Carnage (also for the SNES and Sega Genesis) and both of them seemed to have more revenue for marketing, so I'm not surprised if this game got overlooked by a large majority of console players. 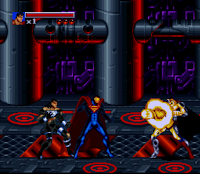 X-Men: Mutant Apocalypse and The Adventures of Batman & Robin for the SNES were both released several months later, and, personally, I know which of these games I would've been saving my money for at this time in my life. 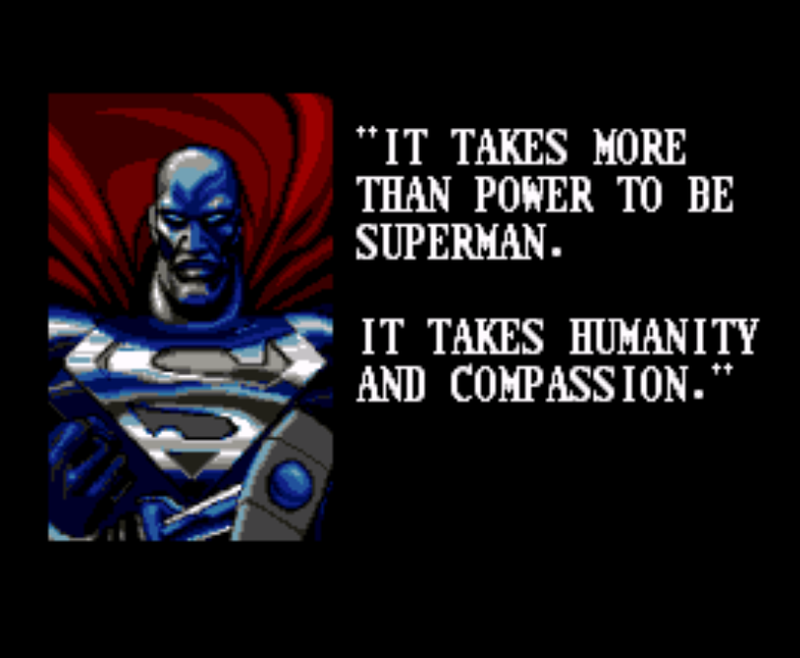 [Hint: Not Superman]. 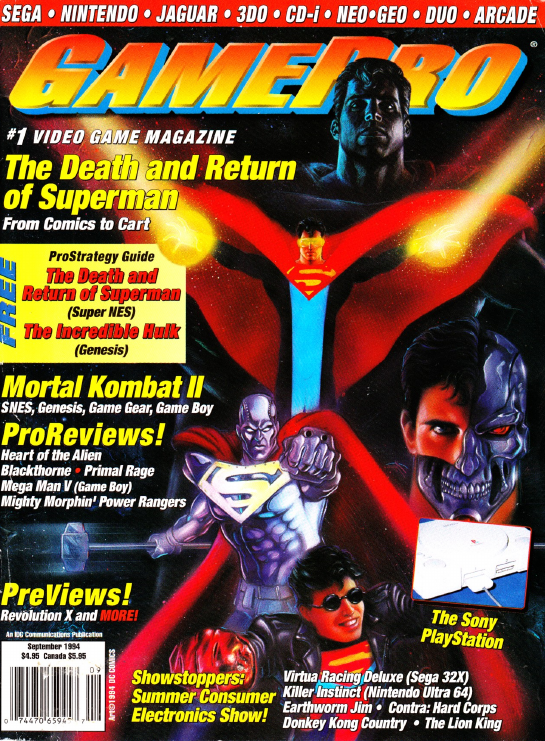 Defunct Games gives us a really nice snapshot of what was happening in the gaming industry during the summer of The Death and Return of Superman's release. Well look at THAT... this game was created by Blizzard Entertainment. I was not aware of that. 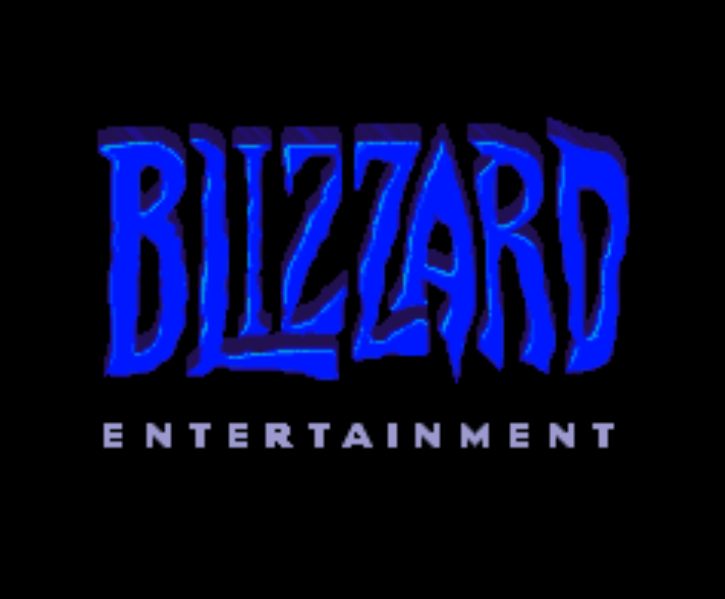 If you were an avid PC gamer in the 90s, Blizzard would mean *something* to you. Blizzard was responsible for releasing Warcraft: Orcs and Humans, a real-time strategy game for the PC and Mac, in 1994. While Orcs and Humans didn't make a big splash (at least among my high school social circle), it was the following year's Warcraft II: Tides of Darkness that all of my peers would talk about for years to come. Blizzard's Warcraft II and Electronic Arts' Command & Conquer would lead the real-time strategy race (which is all high school kids want to play, apparently) and lead to many 'lost' Friday and Saturday nights playing against friends on your dial-up modem from home. [Remember those?] Blizzard also released Diablo in 1996 — another very innovative game that was much cherished by fantasy role-playing fans for years and years to come. 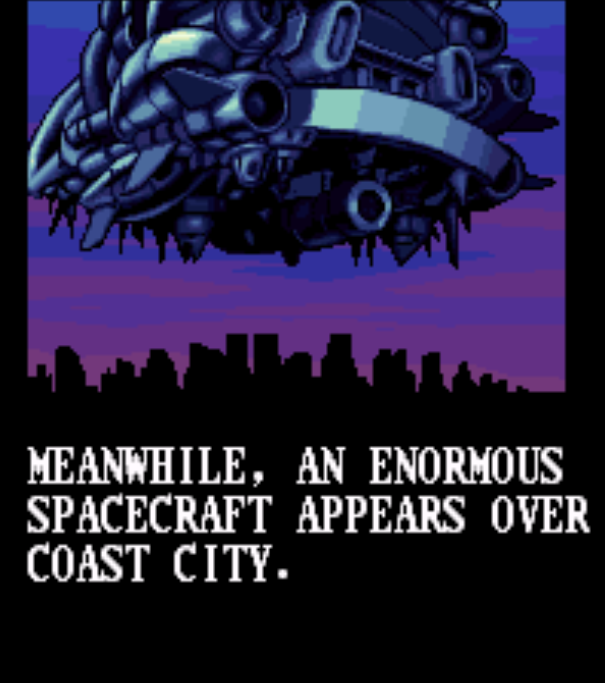 In short, I didn't realize Blizzard developed Super Nintendo games, and now I have high hopes for this game since Blizzard sets a pretty high bar. 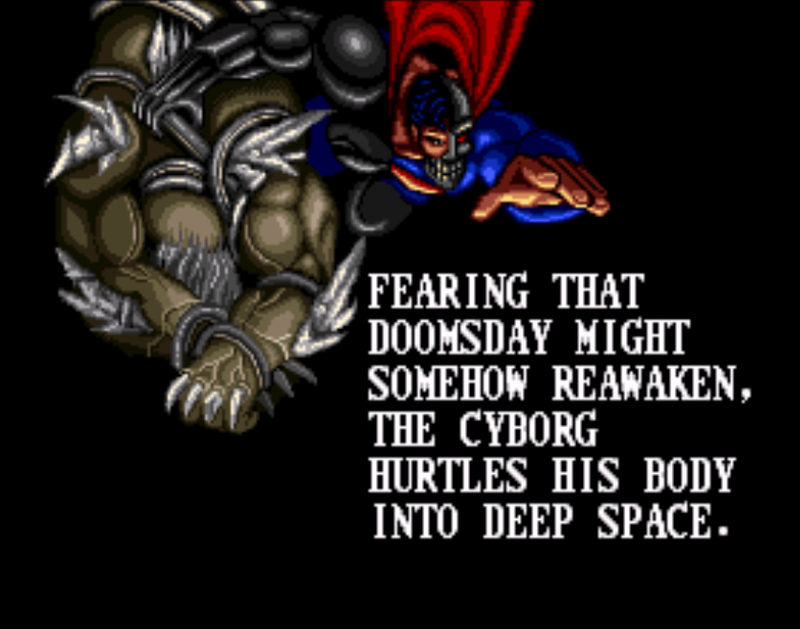 The title screen begins with some very ominous 8-bit music and Doomsday's first punching through a bloodied Superman shield. A very nice touch. So far, I'm impressed with the quick descriptions of these characters. 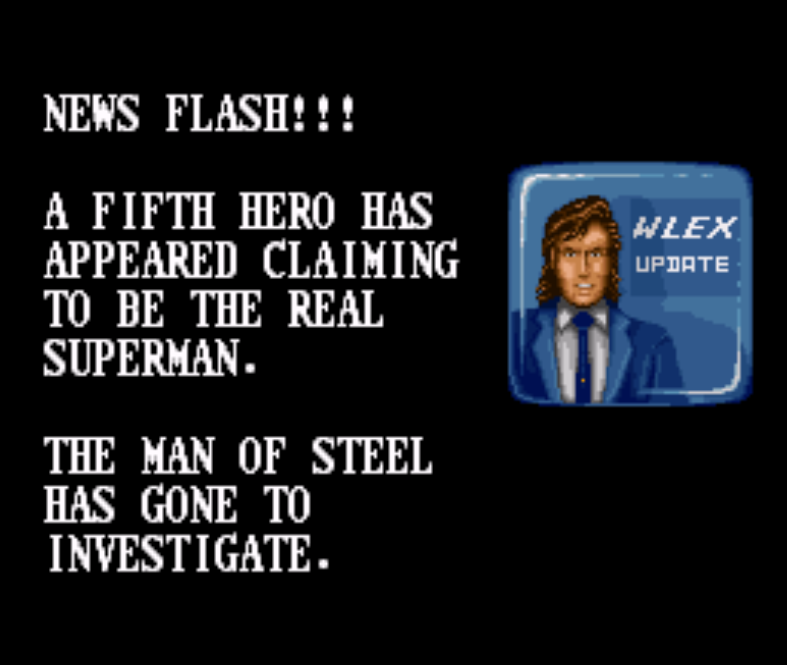 The game is really playing up the "who is the real Superman?" mystery [as if we didn't already know]. 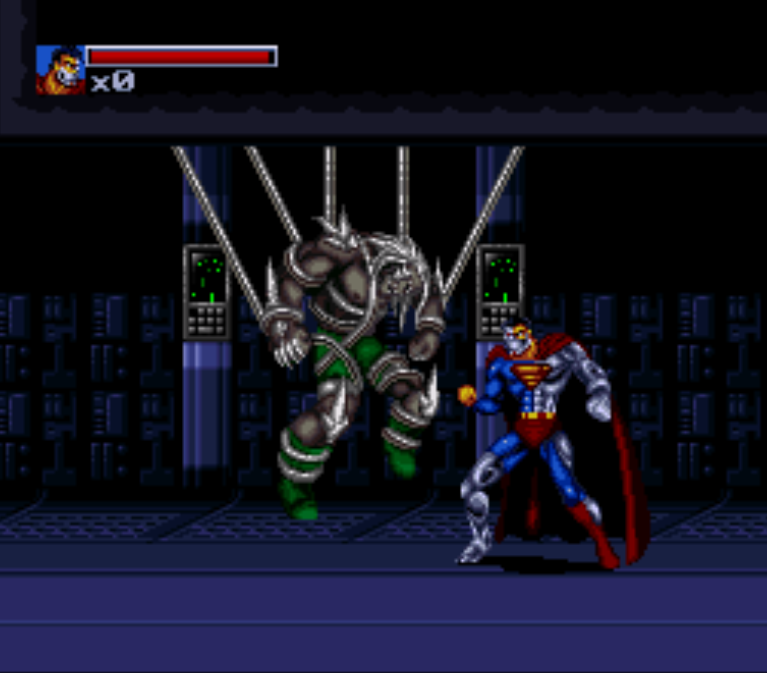 Still, it's a nice attempt at recreating the original suspense created by the Reign of the Supermen! story arc. 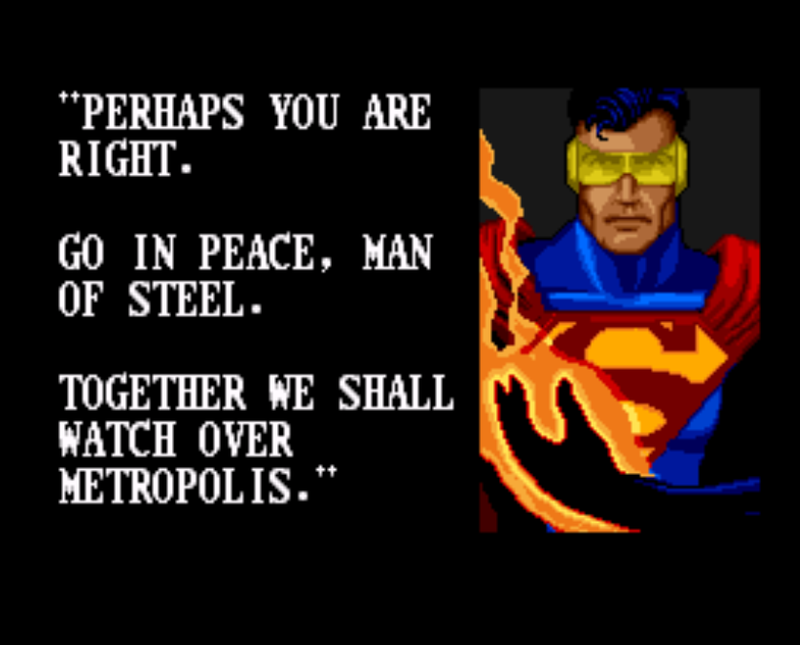 Maybe there were a few gamers out there who were unfamiliar with the Death of Superman story line. I doubt it. 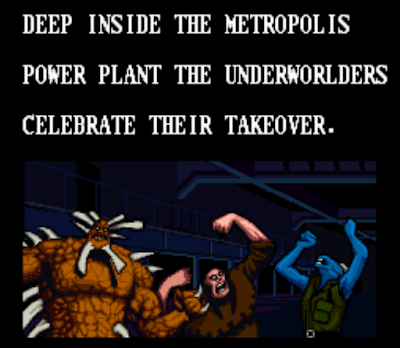 The first part of the game begins with the Underworlders taking siege of Metropolis' Power Plant (or something to that effect) and we get a nice little cut scene outlining this. 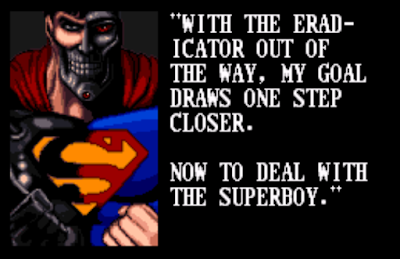 I remember this as being the prequel to Superman's battle with Doomsday (Superman: The Man of Steel #17, 1992). 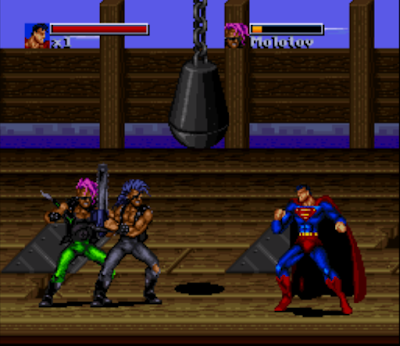 I specifically remember that spiky brown dude on the left. I wonder if he's going to be a boss? 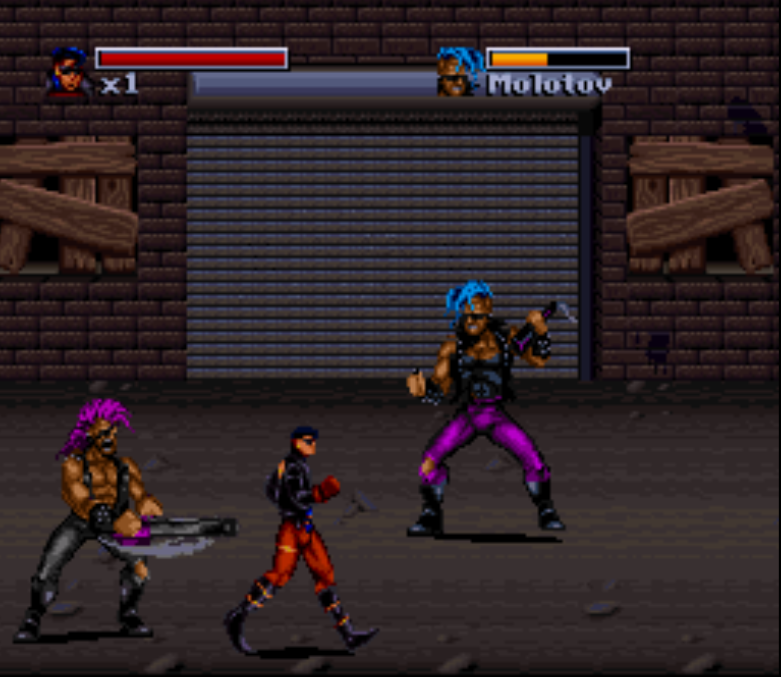 As mentioned before, the level pretty much plays like Final Fight. 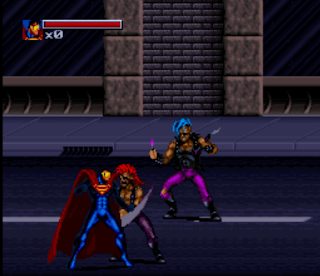 You are walking around beating up enemies on screen. They all have little health meters to tell you how close they are to being defeated. Some are ranged attackers and some are brawlers. Superman himself can do four things: he can punch, he can shoot lasers from his eyes, he can sort of jump/hover/fly and he can release a super attack that damages every enemy on screen (but he only get a few of these per level). 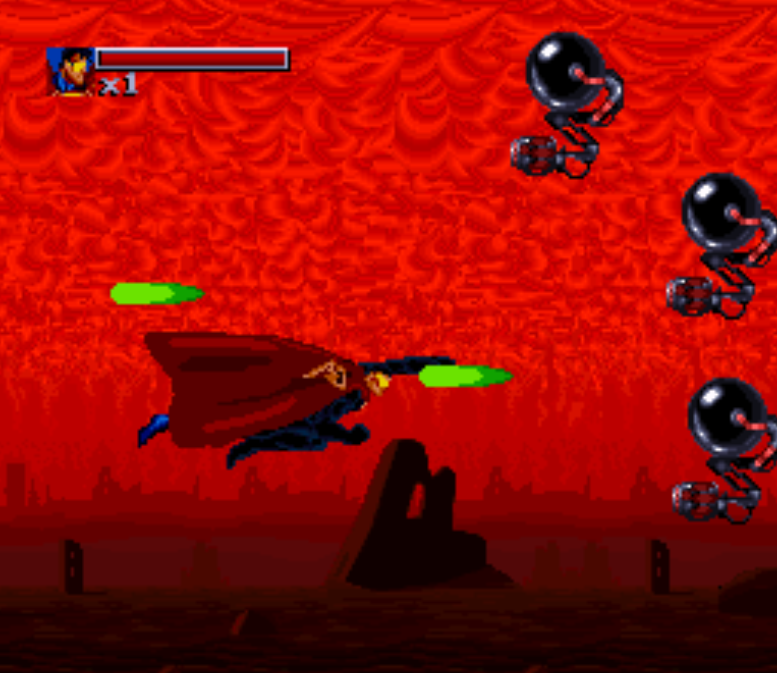 As the level progresses, you can pick up power-ups to raise your health, or grant you an extra 'super attack'. In this game, Superman has the same stamina and durability as a man wearing a heavy Kevlar vest — are those Kryptonite bullets being shot out of that machine gun? 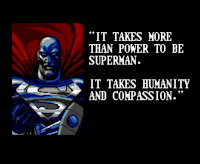 Because it's cutting Superman down pretty fast. 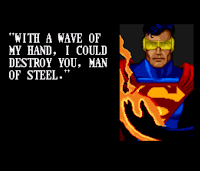 I realize that it wouldn't make the game very challenging if Superman was in "God mode" throughout the duration of the game, but you'd think they'd make the threats a bit more menacing? At some point in the level, you need to jump/hover over electric fences and watch out for falling debris. 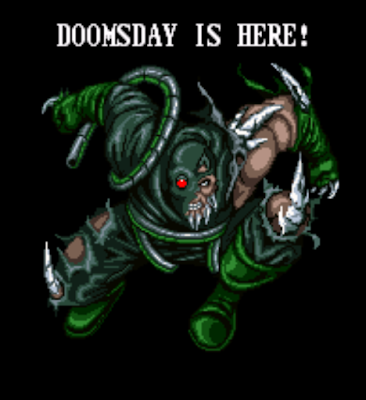 The game wastes no time and by the second level I am slated to encounter Doomsday. The cut scene mentions the Justice League, but there are no digitized images of the trashed Justice League of America to be found — which is a shame because that was one of my favorite parts in the Death of Superman. Not even kidding. 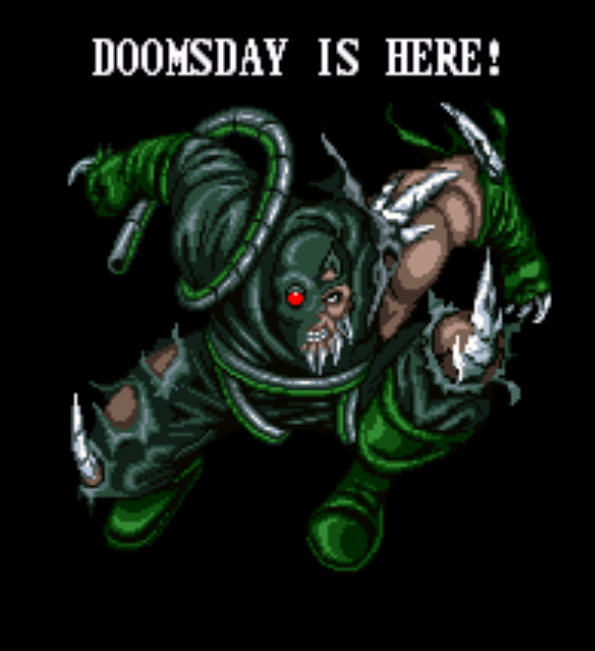 As you keep battling, on a construction site apparently, you end up meeting Doomsday halfway throughout the level. He's surprisingly easy to take down, but just jumps away at the end of the battle. Why is this level set on a construction site? 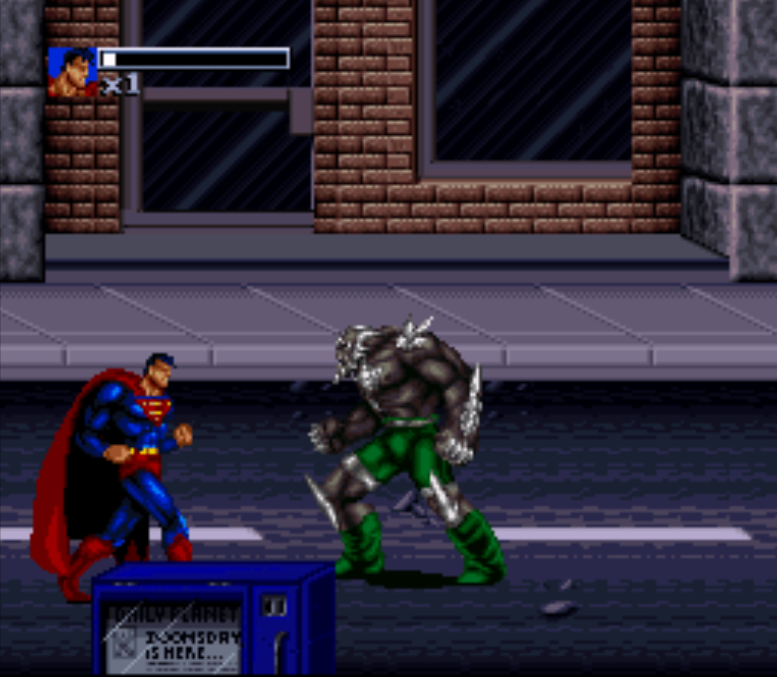 I have a vague memory of Superman battling Doomsday at a construction site (or maybe Doomsday was demolishing a construction site), so I guess the game designers decided to run with that. I thought the second level would be a breeze, but it's really quite difficult (either that, or I'm lousy at these things). 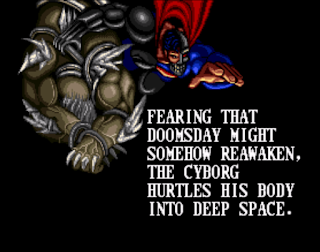 The second level ends with a rematch with Doomsday. It took me five 'continues' to complete level 2. If you're wondering why I'm struggling through this, it's because I'm not using cheat codes. Call me a 'purist' or whatever. Remember when I told you it took me five attempts to get through level two? Yeah, it was really more like a dozen. This is a really difficult game. After the seventh attempt I had to walk away from the game for a while, just to cool off. 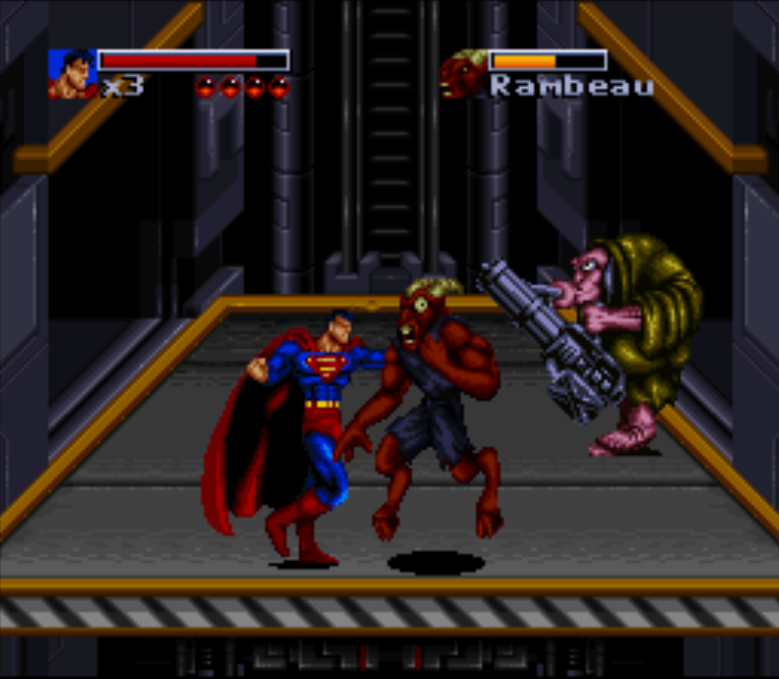 I'd get so close to finishing the level, but would get TKO'd in my final match with Doomsday thanks to some unstoppable combo attack from the Metropolis monster himself. 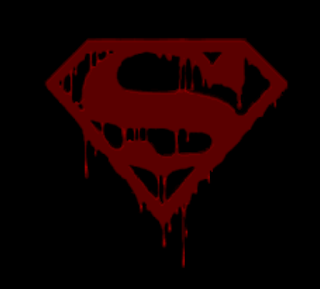 Isn't Superman dying integral to the plot of The Death of Superman? Yeah, I'm just ranting here. I wonder if the 'continues' are unlimited? If this game was ported for arcade, it would've been designed to eat quarters; it gives you just enough hope to think you are going to do better the next time you attempt the level, and you even get a little bit further than last time and... BAM!.. game over. Like every other Nintendo game I've ever played, it's just about pattern recognition and memorizing when to dodge and where to punch. And power-ups. You NEED those power-ups to get through the level. Anyways, the battle ends at a standstill as both combatants keel over (true to the comic book). 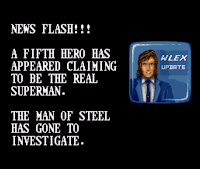 After a brief cut-scene demonstrating Lois Lane's grief, news reports of new Supermen being spotted are promptly displayed. Now we're getting into the 'meat & potatoes' of the game, so to speak. 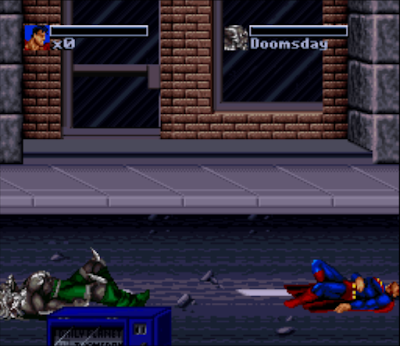 I really have no interest in Superman and am mostly interested in playing as one of the four Superman 'imposters'. 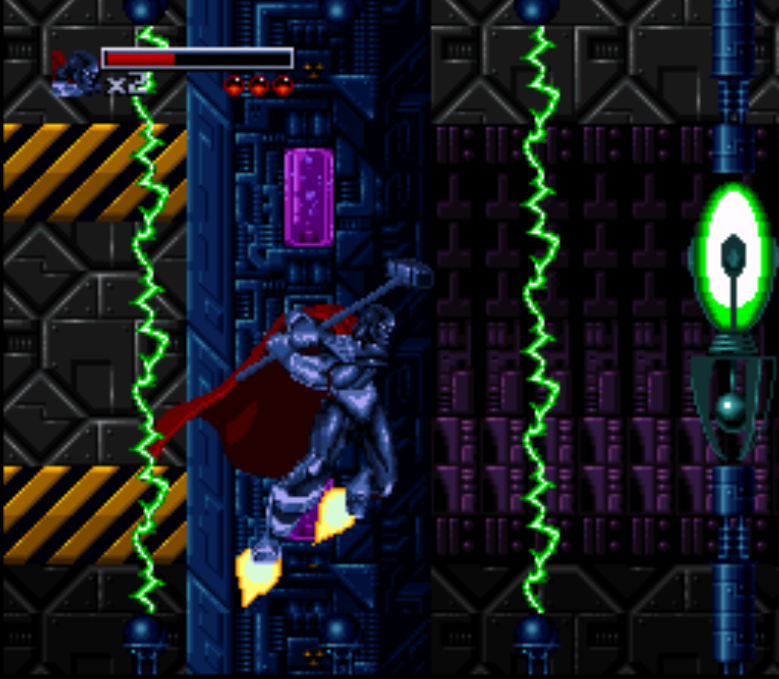 The last grueling level was just a lead-up to THIS moment. 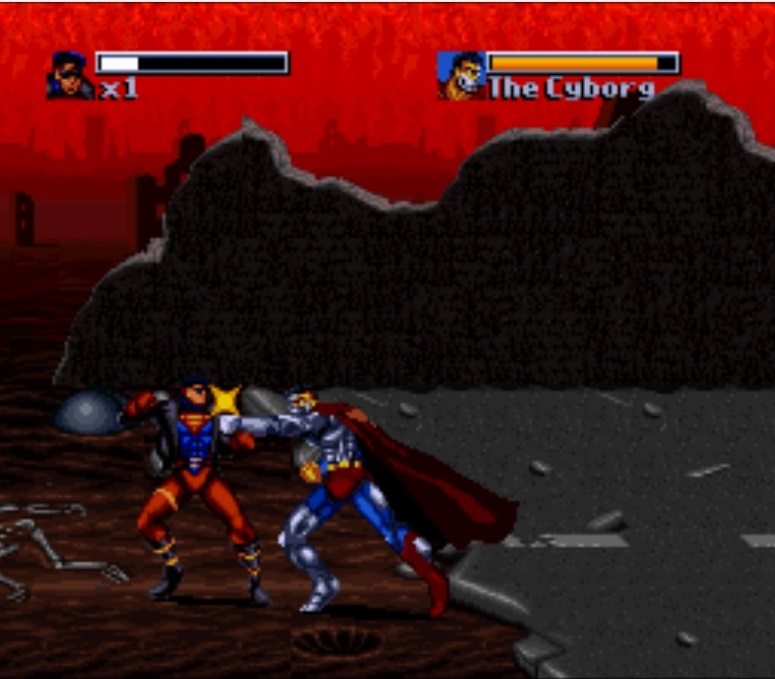 Level 3 has Cyborg Superman assaulting Cadmus. It seems to be a bit easier as the level is more generous with power-ups. 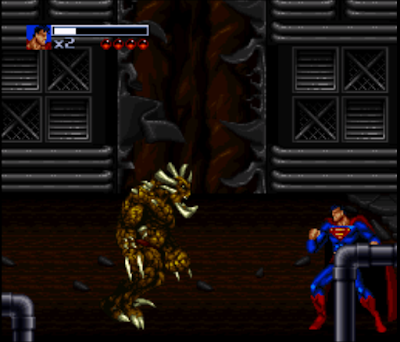 Maybe level 2 was meant to be more difficult in an attempt to emulate Superman's intense battle with Doomsday? If that was done intentionally, I applaud the designers. 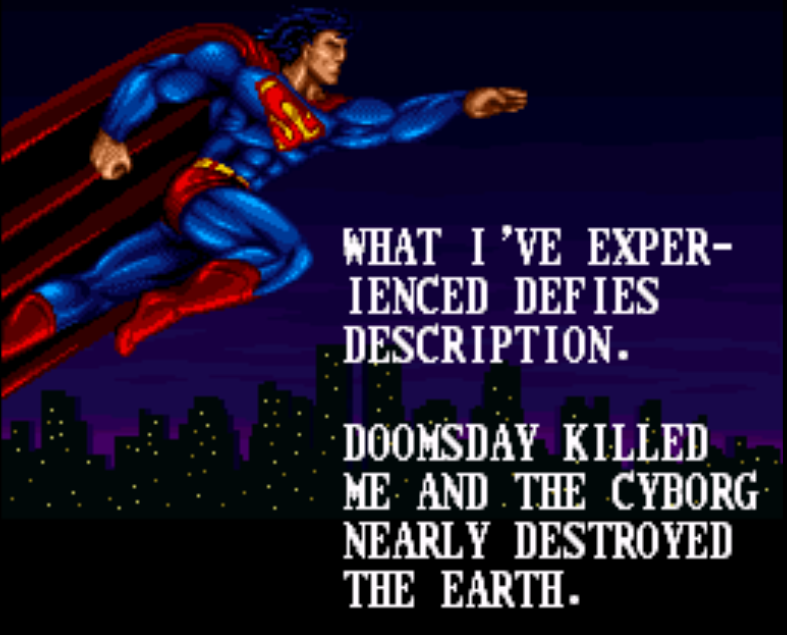 The 2nd level's final Doomsday battle was pretty anticlimactic in the grand scheme of things. Cyborg fights his way through the tree forts of Cadmus in order to... I don't know what his goal is. The game doesn't tell me why. 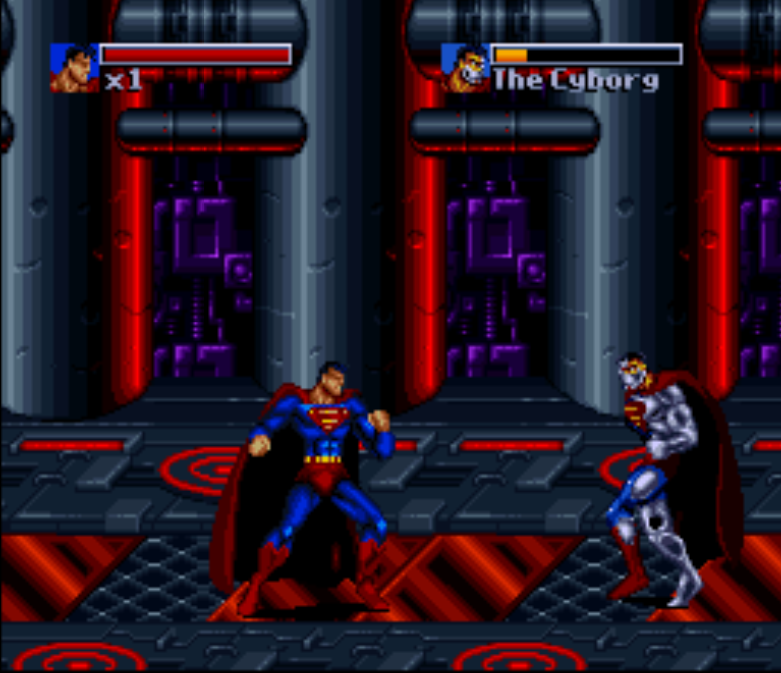 I thought playing as Cyborg Superman would give me a different power set (i.e. more powerful projectile weapon, better flying. etc), but no, it's the same moves Superman could do — except now I'm dropping a grenade instead of power-slamming the surface when I use my special attack. So I'm back on the mean streets of Metropolis fighting punks and anarchists the way only an Eradicator could. 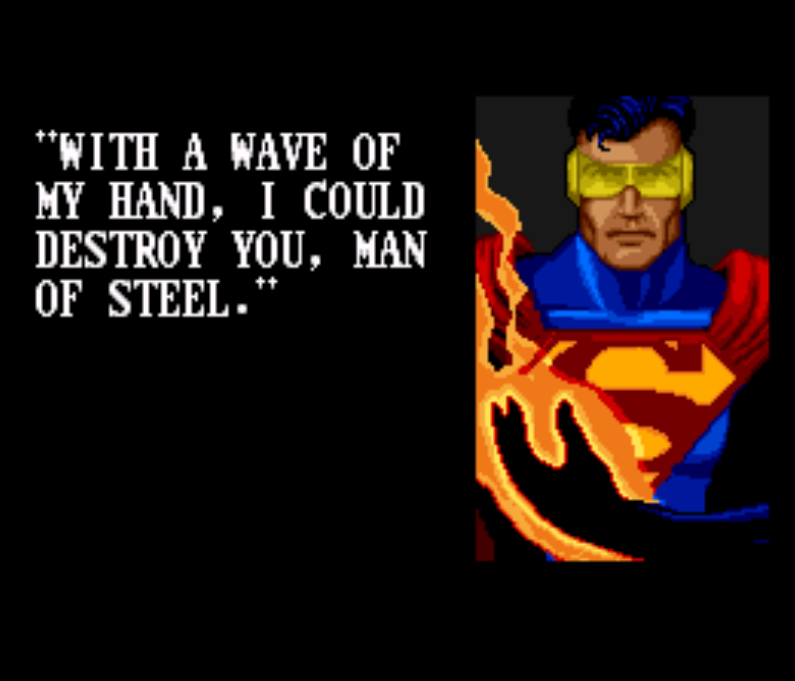 I don't remember the Eradicator taking the war to street crime, but it's kind of obvious at this point that the designers are taking a few 'artistic liberties' with this game. 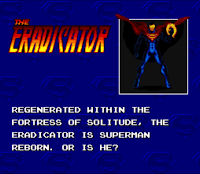 Now that I'm thinking about it, Eradicator's 'big debut' in the Reign of the Supermen! story arc was mercilessly attacking a purse snatcher, so maybe this syncs up. 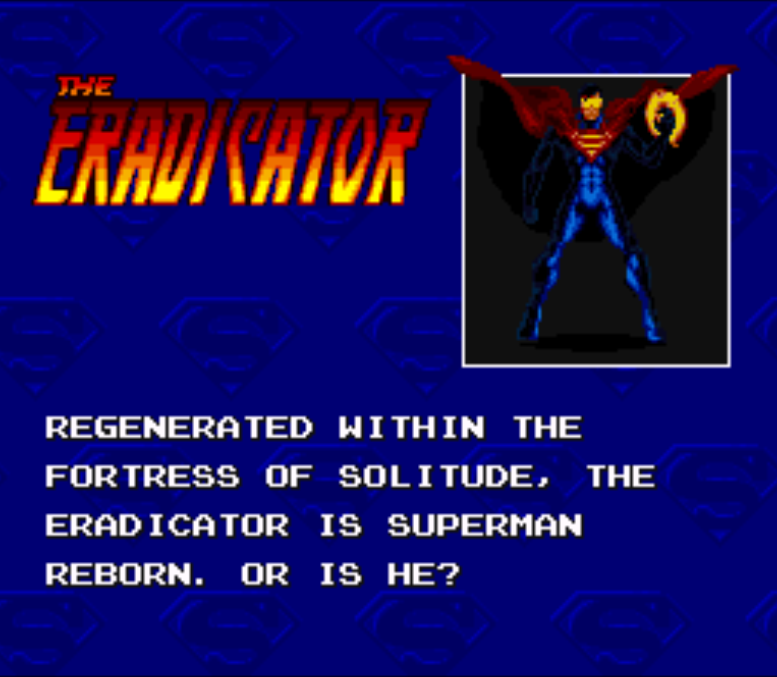 I'm not sure if I'm just 'projecting' since he's my favorite of the four Supermen, but Eradicator's kicks seem to be more powerful and faster. He still has the same four standard attacks: jump, punch/kick, shoot and power attack. 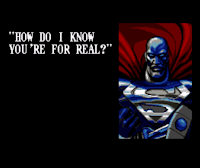 I'm suddenly reminded that the four Superman confronting each other to check out who was the 'real deal' was an important component of the Reign of the Supermen! story line. I'm really glad Blizzard didn't glaze over this detail. Steel is kind of predictable and relatively easy to take out. Once he's down, we're treated to some cut-scenes explaining what's going on. Level 5 has Eradicator investigating the destruction of Coast City. 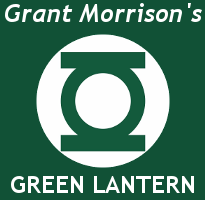 Will Hal Jordan (aka Green Lantern) appear? I'm really hoping he does. Coast City being destroyed in The Death and Return of Superman is what ultimately led to Hal Jordan going 'over the edge' and destroying the Green Lantern Corps (you can read all about it in Emerald Twilight). 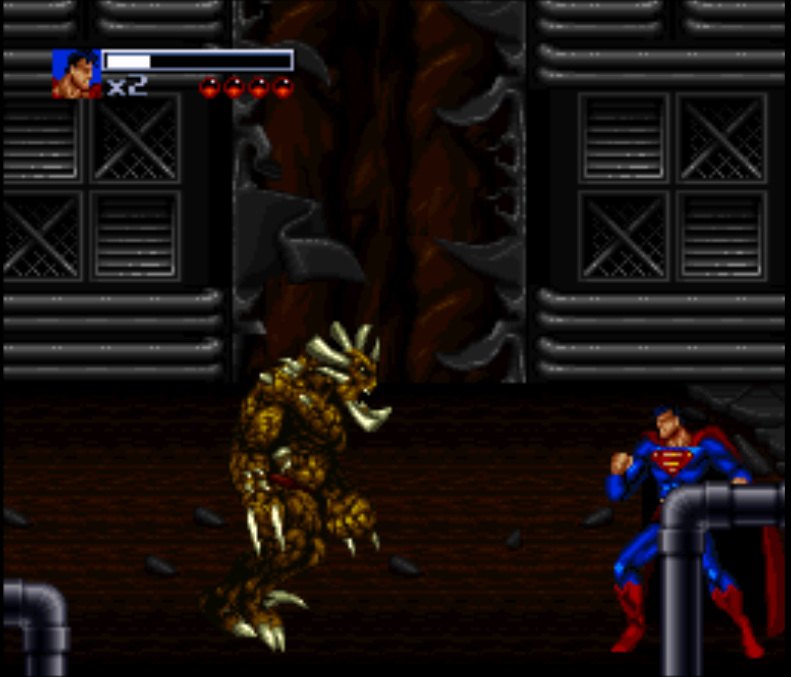 It's an important moment in 1990's DCU history. 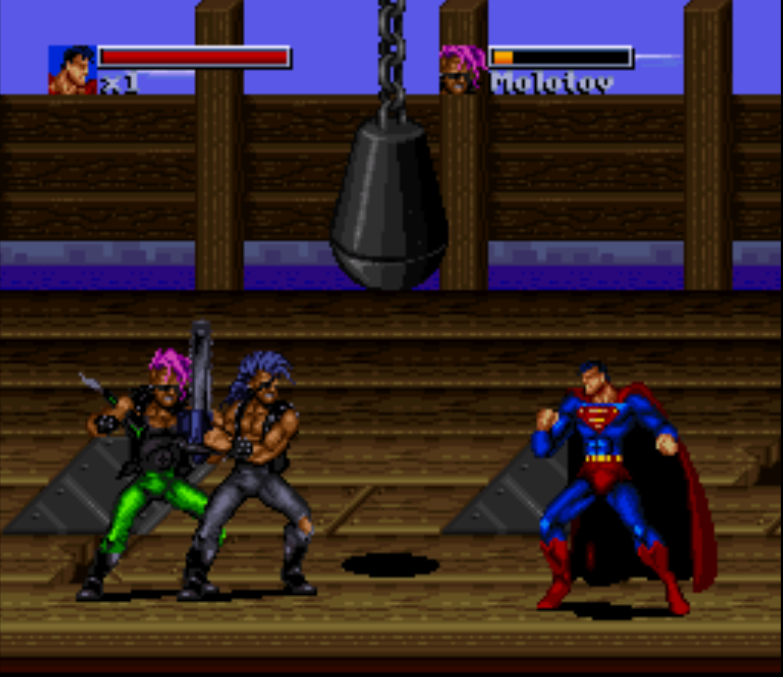 ...and resumes with more beat 'em up on the ground of the war-torn Coast City. If level 4 felt too easy, level 5 really wants to correct that by throwing everything at you: deadlier enemies (one of them has a grabbing claw), random land mines, falling debris and more aerial-based villains. This is a really tough level. 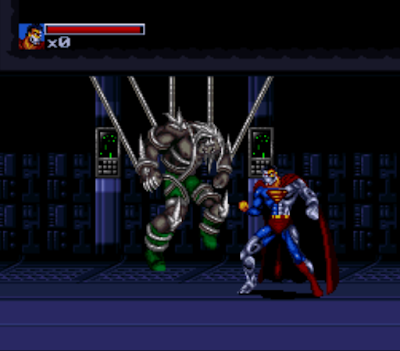 Despite beating Cyborg Superman, he still gets to defeat you. This follows the sequence of events that unfold in the story arc, so this is still alright by me. Hal Jordan does not show up. And we're on to Level 6. 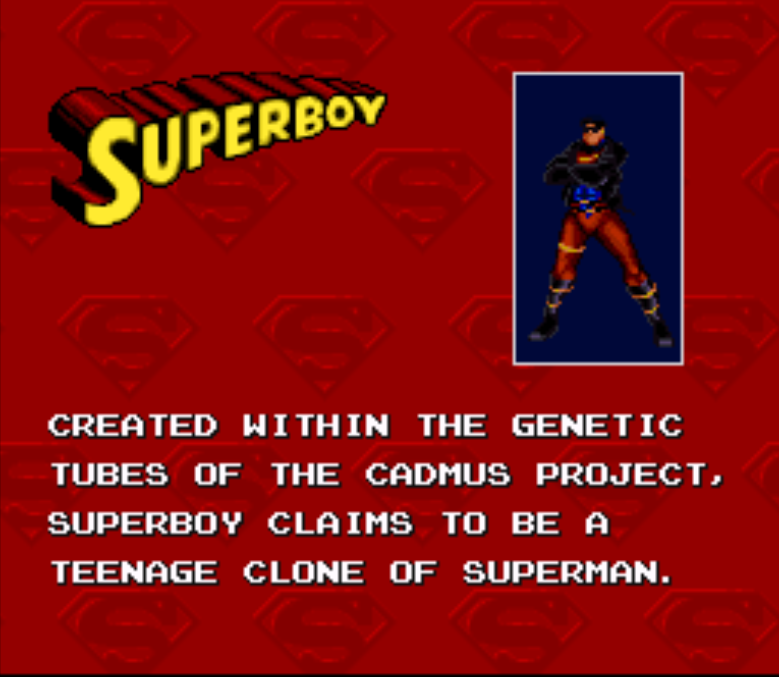 Also known as 'The Metropolis Kid', Superboy starts his level street fightin' in Metropolis (and not breaking out of Cadmus, like I would've assumed). 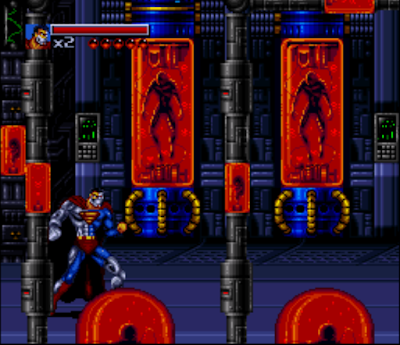 Superboy seems to have a quicker 'jump & attack' than any of the other Supermen, but it's a subtle advantage. Or I may be imagining it. On another note, I collected the Karl Kessel/Tom Grummett Superboy ongoing series in the early 90s — not because I had an affinity for the character, but because it was there. (And probably because I hoped issue #1 would skyrocket in value someday. Ha!) 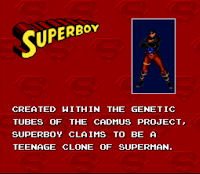 Superboy's telekinetic-based powers never really made much sense to me, in the grand scheme of things. It might be my imagination, but in this game, Superboy seems quicker and more nimble for melee combat. 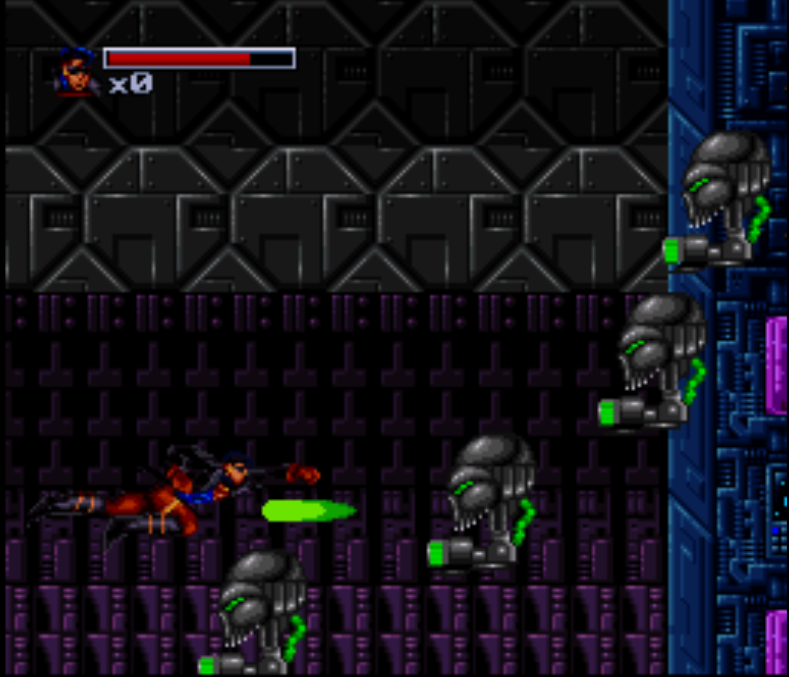 I'm also starting to realize that there's a way to grab enemies and throw them into other enemies. If you can master this, it'll cut down your street fightin' workload a lot. 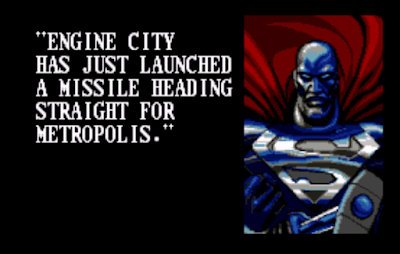 It seems like the streets of Metropolis was the warm up, because the main event is Superboy going to Coast City. 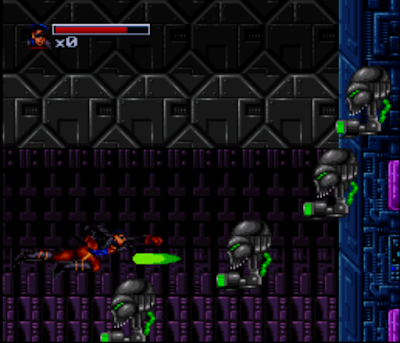 This whole level goes from zero to sixty as you suddenly need to fight all sorts of flying opponents, enemies with grappling claws, landmines and more falling debris. It also seems like the game AI is getting smarter. 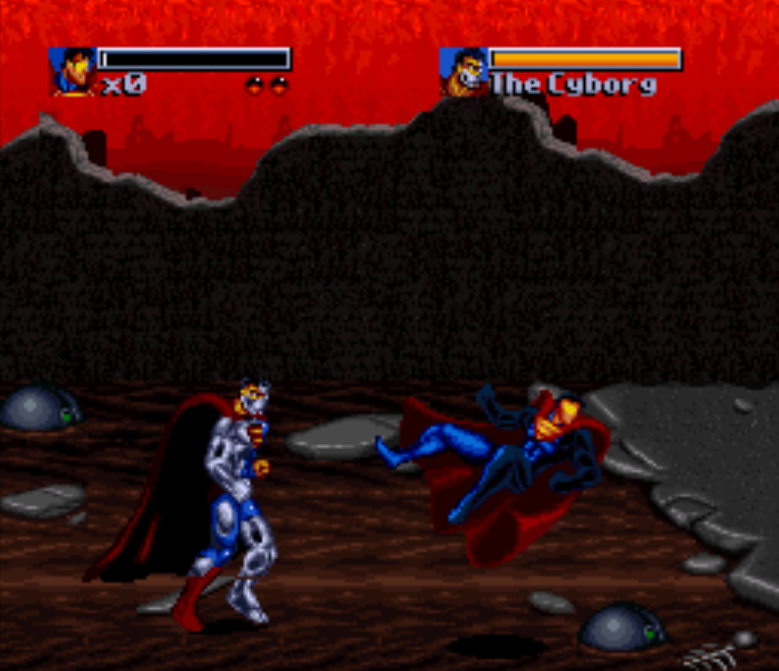 Even after you knock out Cyborg Superman, the level is NOT over. 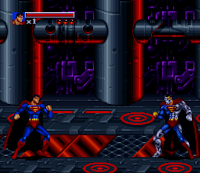 What feels like the longest level in the game concludes with a brief aerial side-scrolling segment meant to represent you escaping from Engine City after Cyborg Superman captures you. 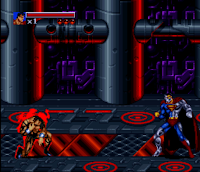 Thankfully, the aerial side-scrolling sections are the MOST generous with power-ups, so you MAY be able to keep yourself alive long enough to complete the level. 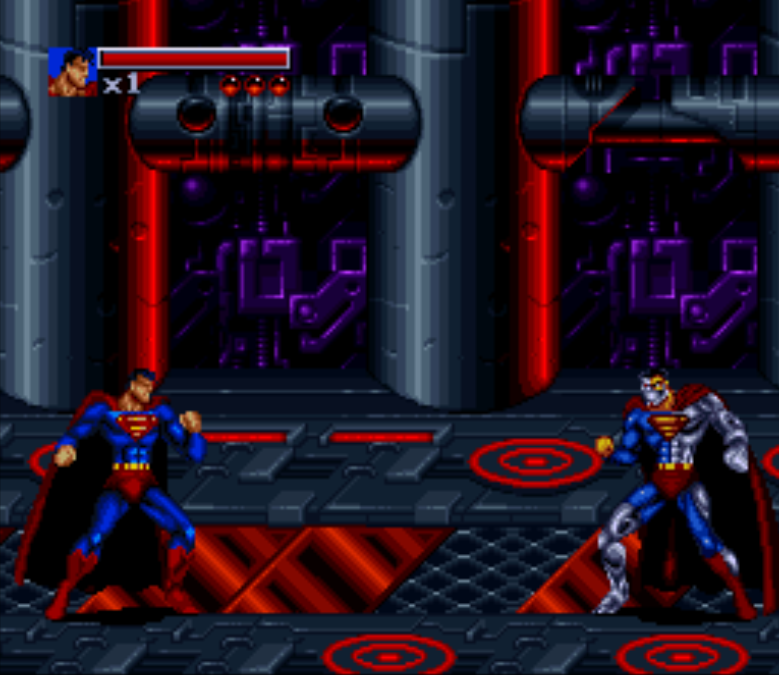 Level 6 ends with a cut-scene revealing that a fifth Superman has shown up in Metropolis, and that now it's time to play as Steel. 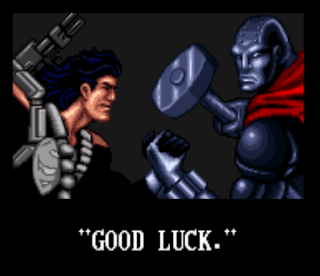 Steel is a really fun character to play — his sledge hammer gives him a really long reach for close combat attacks. 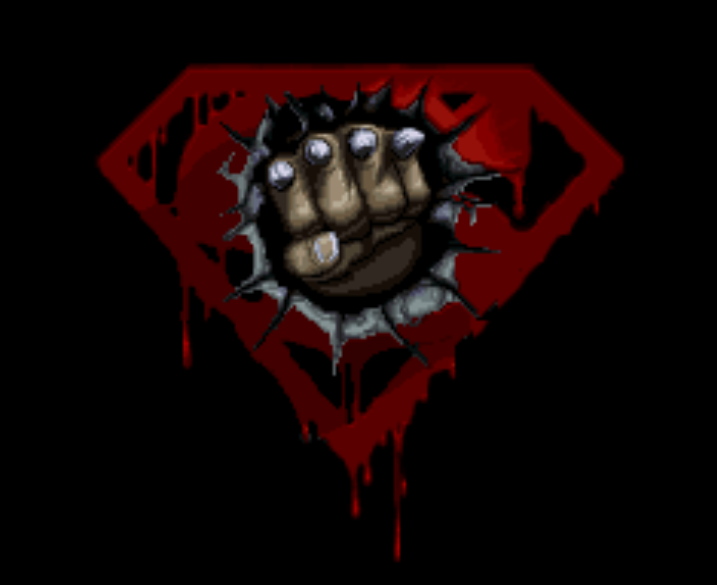 In retrospect, of the four Supermen, Steel may have had the most active career in comics post-Reign of the Supermen!. 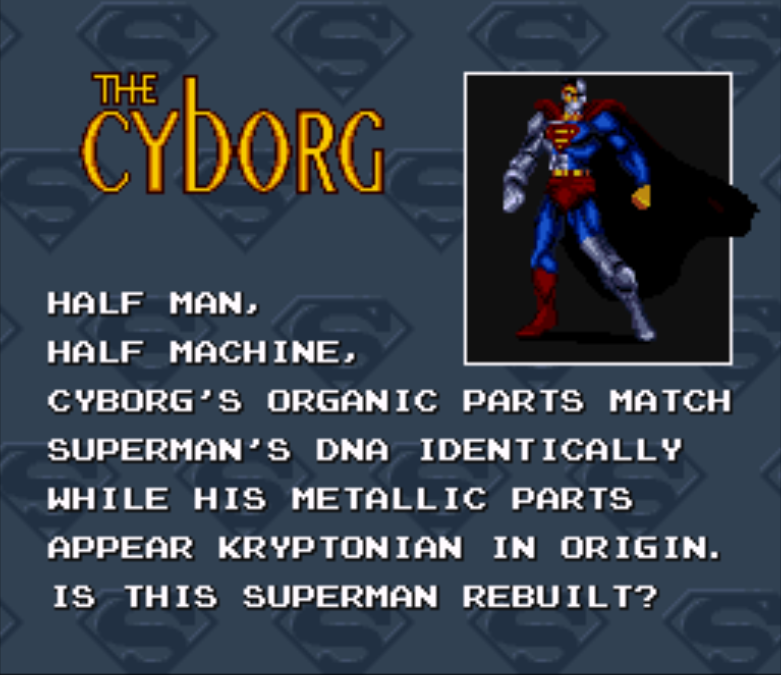 I was absolutely sure he was going to get absorbed by DC's Milestone Universe [home of Icon & Rocket, Hardware, Blood Syndicate and Static] during 1994's World Collide story arc, and was surprised he didn't. 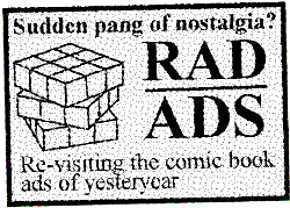 Which was probably for the best — Milestone essentially ceased publishing in 1997. 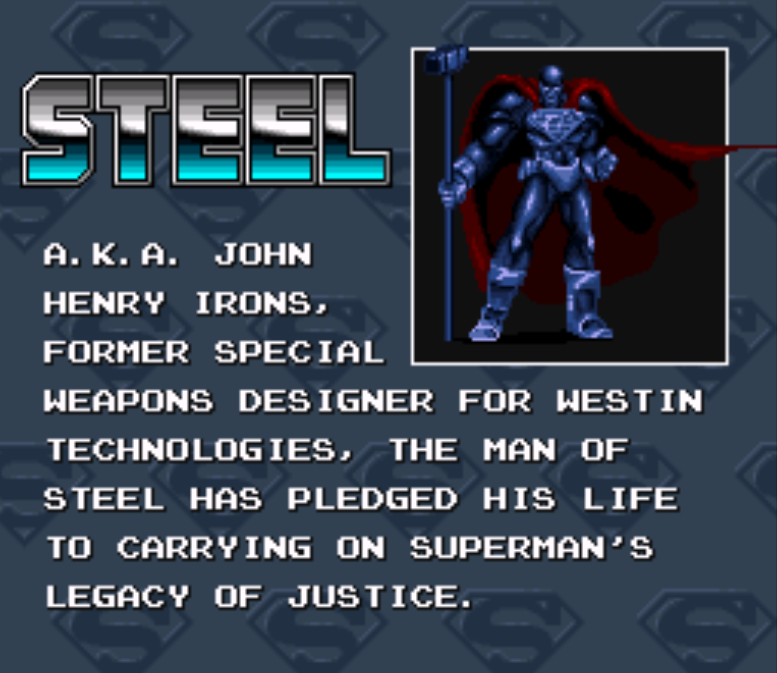 Steel's ongoing spin-off series ran from 1994 to 1998, after which he'd still play a supporting role in the DCU (first as a member of the JLA, and then as a mentor to his niece Natasha Irons). 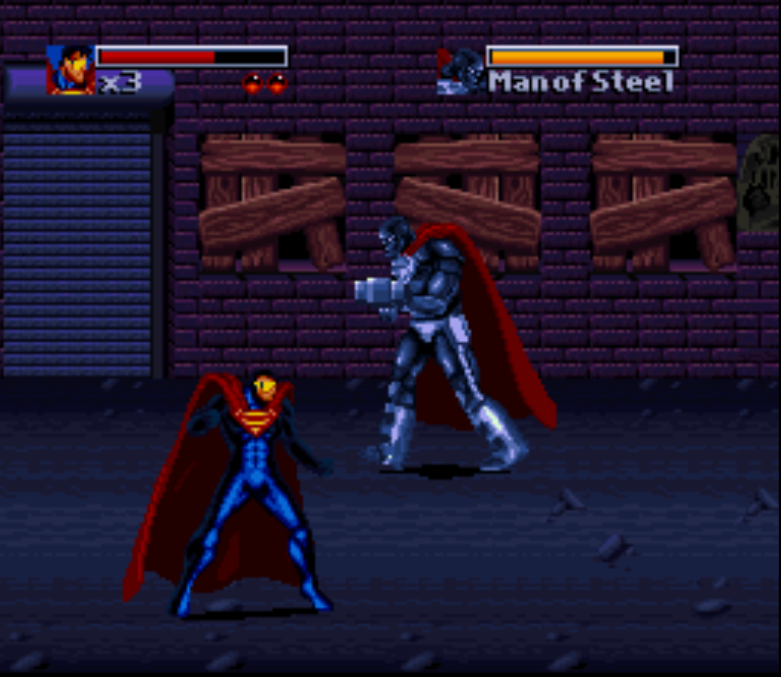 As Steel, you continue fighting an endless onslaught of generic villains. In the long run, the hammer doesn't make fighting much easier or more efficient, so prepare to fight harder than you've ever fought before. Thankfully, level 7 is merely an 'endurance run' where you need to fight all the generic villains to complete the level. 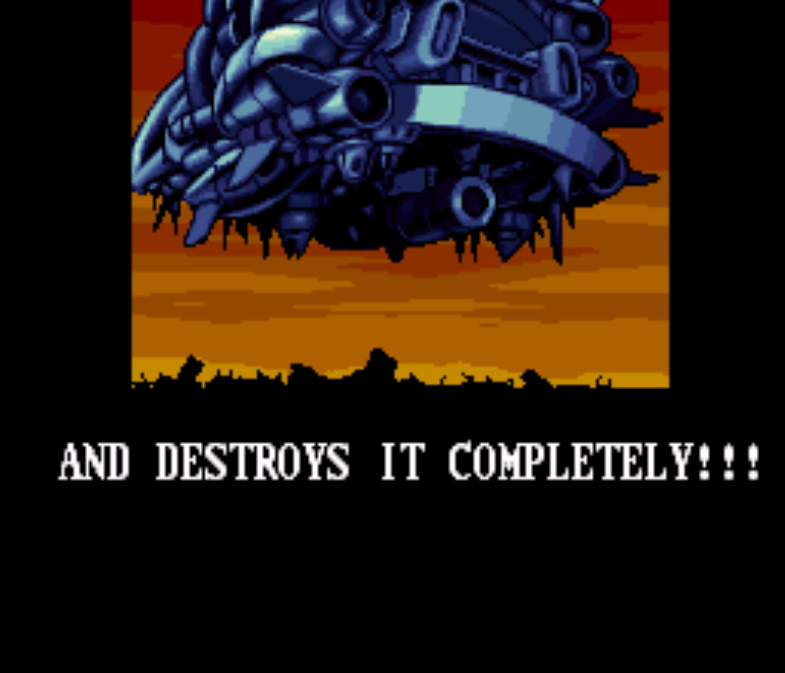 No crazy end bosses in this one. 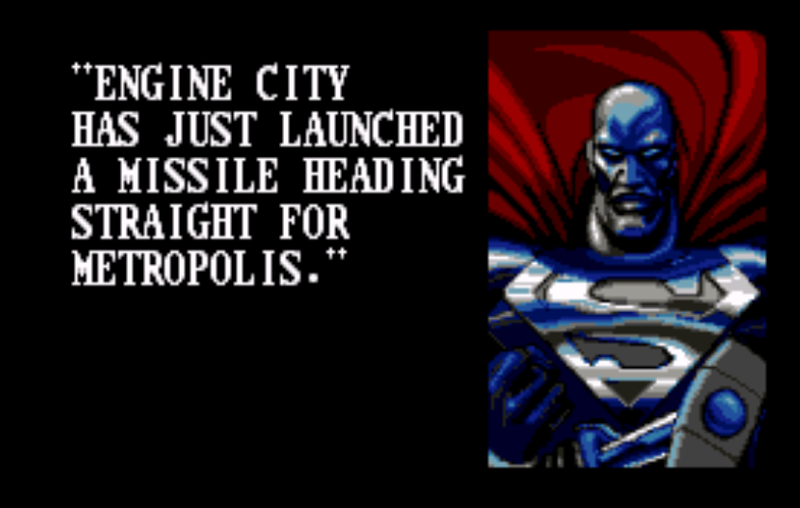 I don't actually remember Engine City launching a giant missile at Metropolis, so I was just as surprised by the next level as you are. 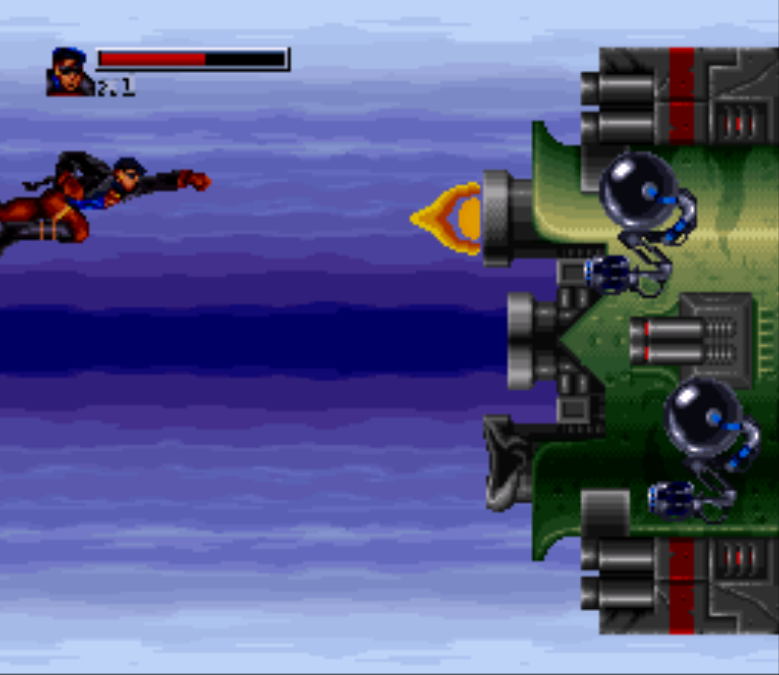 As a horizontal side-scrolling shooter, this level was a bit more generous with the power-ups and a nice change of pace from the rest of the beat 'em up levels I previously experienced. I think that if the game designers had added MORE levels like this, it would've broken up the repetitious monotony of the game. Anyways, this level was REALLY short and served as a nice intermission before more beat 'em up mayhem. 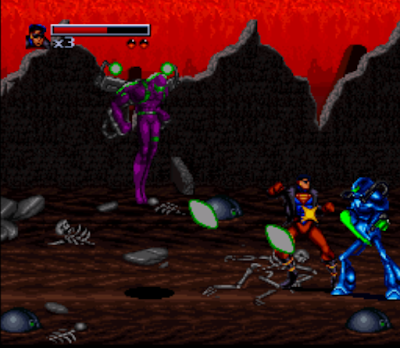 Level 9 is a side-scrolling obstacle course. Steel flies upright, apparently, so it's a bit more difficult to navigate around the obstacles. 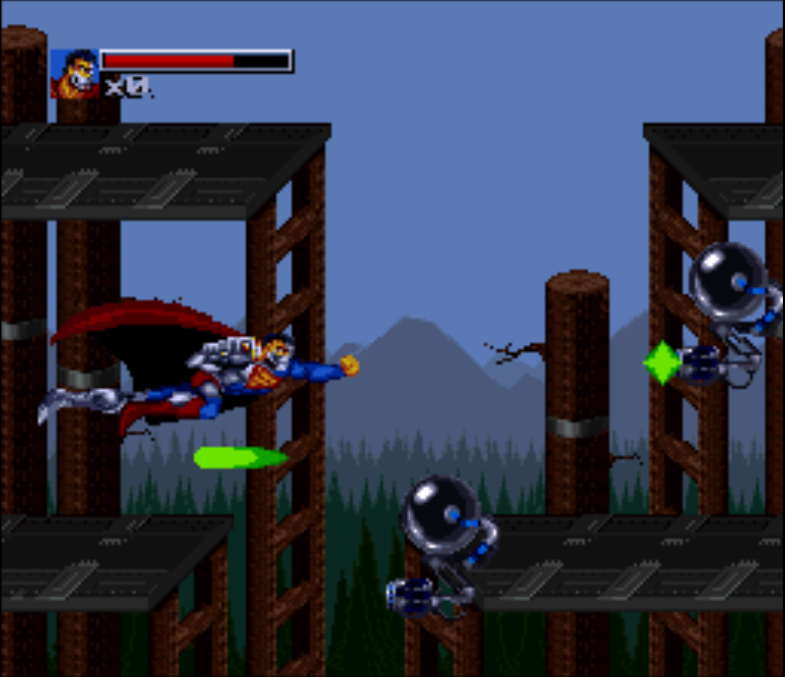 The whole purpose of this level is for Steel to destroy the kryptonite 'heart' of Engine City. Again, I don't recall this — so let's just see where it goes. The level ends with Steel battling a giant metal skull that shoots beams at you. I don't know if the giant metal skull is supposed to be Cyborg Superman... or possibly Metallo... or just a made-up villain meant to represent the 'heart' of Engine City. Either way, it goes down pretty easy. This was actually one of the easier levels in the game - which is kind of backwards for gameplay, since level 2 was one of the hardest levels in the game. 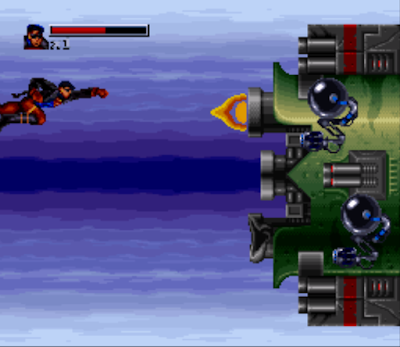 This was also one of the only levels in this game where shooting projectile beams was actually useful. 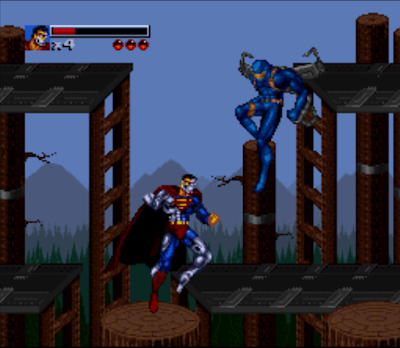 The final level, level 10, is the "Return of Superman". There's a nice little cut-scene at the beginning of the level with Cyborg Superman shooting the Eradicator INTO black suit Superman causing them to merge and revert into the ol' red & blue Superman. Okay, THIS I remember (sort of). By this point, I'm a little eager to complete the game. The last two levels have proven to be easier than everything else I've faced so far, so let's see what [I'm assuming is] the final level brings me. 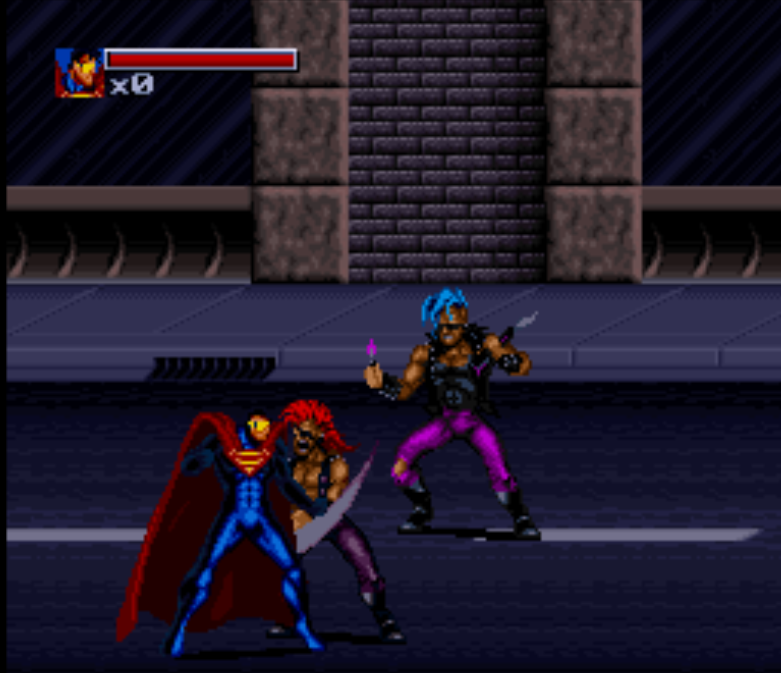 Hmmm... more generic bad guys to beat up, apparently. This level is pretty tough, actually. 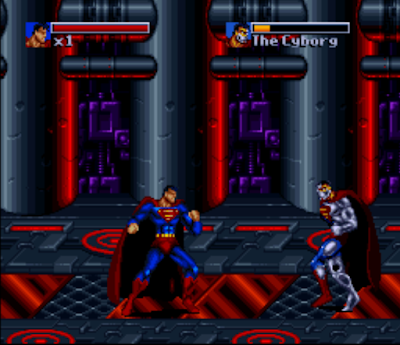 The level ends with Superman battling... (as if you haven't guessed it by now)... Cyborg Superman. 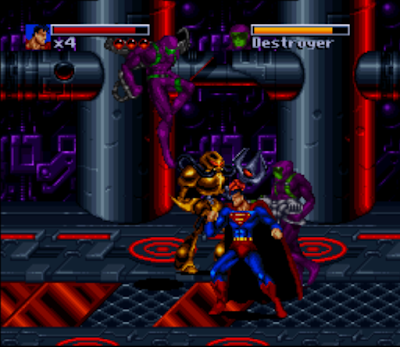 This is another difficult boss battle, with Cyborg Superman going all out and using a whole arsenal of attacks on you. 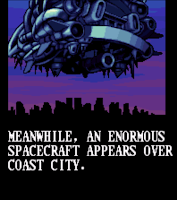 It is the LAST boss of the game, so I'd be somewhat disappointed if he went easy on me. I need to feel like I earned this victory. 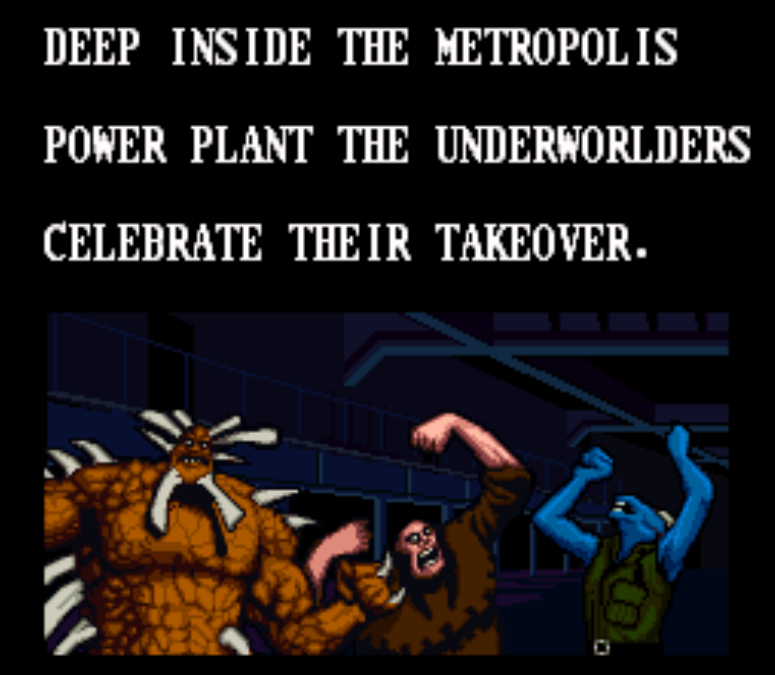 ...and the game finishes by naming everyone on the Blizzard Entertainment and Sunsoft, Inc staff. I keep saying that the game is 'hard', but I wouldn't say so much that it's difficult. The better word here would be 'unrewarding'. The levels are unrewarding. 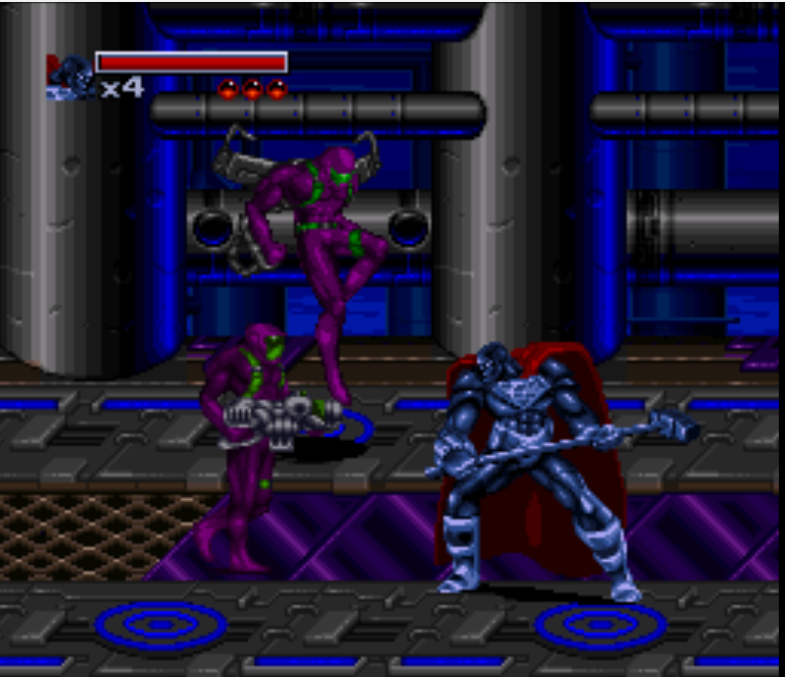 You fight through an onslaught of generic villains (who usually look like one of four different types of attackers — except with a different color scheme) until you get to the boss at the end. I've got to say, if it weren't for the unlimited continues, I would've quit after level 2. These levels are REALLY long and the enemies just don't quit. As previously mentioned, it seemed like this game would've been better suited on the arcade and eating your quarters with those unlimited continues. The end-level bosses all play out the same way: it's a beat 'em up boss battle, so save your mega-attacks until the end of the level and then hit them with everything you've got. A combination of random jumping and dodging might allow you to land those last flurry of hits to KO the boss. 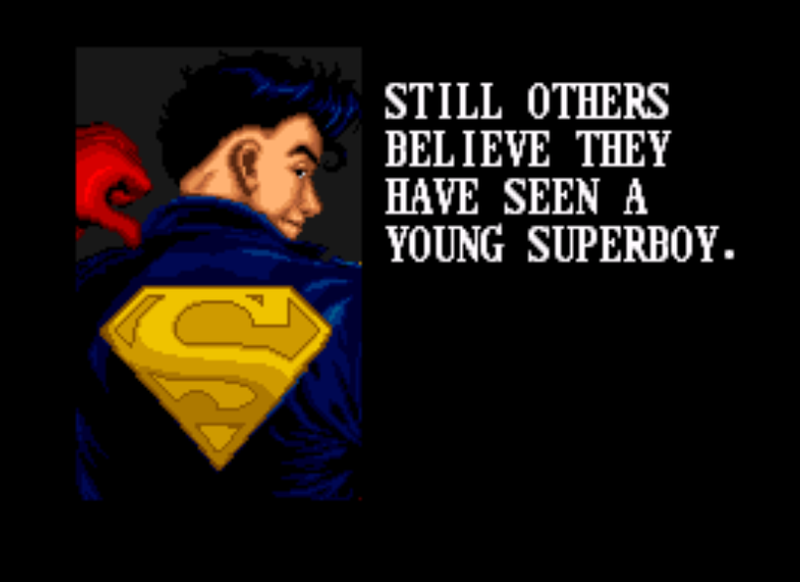 In this last decade, everyone on the internet seems to be remembering this game through rose-colored glasses and citing it as one of the best games the SNES had to offer, but people don't realize that this game didn't get AMAZING reviews when it was first released. Even by 1994 standards, this wasn't a very good game. Electronic Gaming Monthly #67 (1995) and Mega Play #26 (1995) both gave it a very average score, citing the game to be a very run-of-the-mill side-scrolling punch 'em up with repetitive gameplay and moves. Even Wizard Magazine (#34, 1994) gave it a dismal 3 out of 5, citing it as 'an average game that would be a great rental or used purchase'. (A few of the reviewers even admit that they couldn't get past the first few levels.) 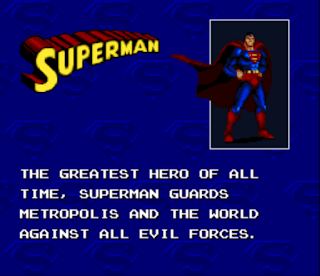 The real reason this game is so fondly remembered is because Superman didn't have much of a presence in video games in the early 90s, and this was your best bet for a Superman console game until 1999's unplayable Superman 64 was released by Nintendo. 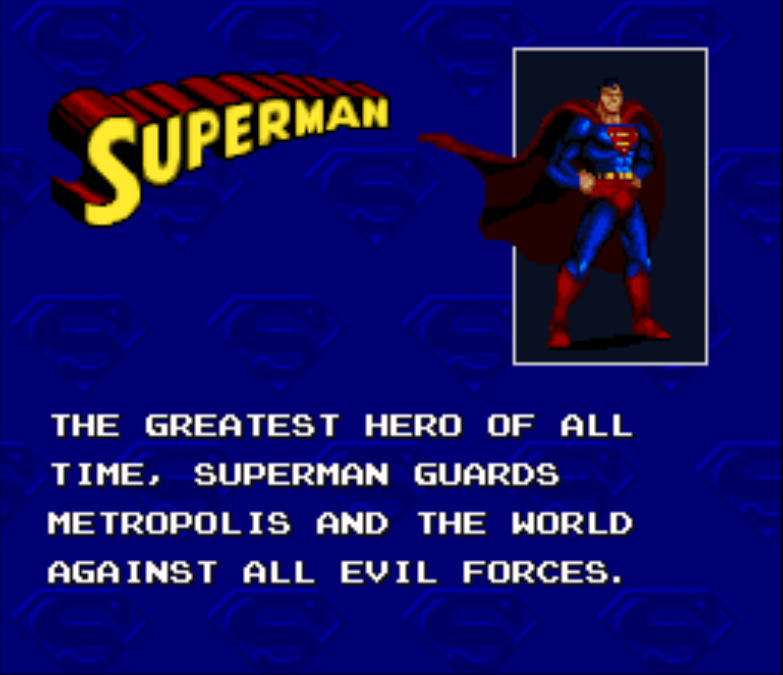 Compared to Superman 64, The Death and Return of Superman is a video game masterpiece. Let's be realistic here: there is little to no replay value on this game. Things that could've fixed that: allowing the player to choose which of the four Supermen to play during any given level, giving the four Supermen noticeably different attacks and powers*, a co-op/multi-player mode or even having unlockable characters/level endings depending on how quickly you finish a level. 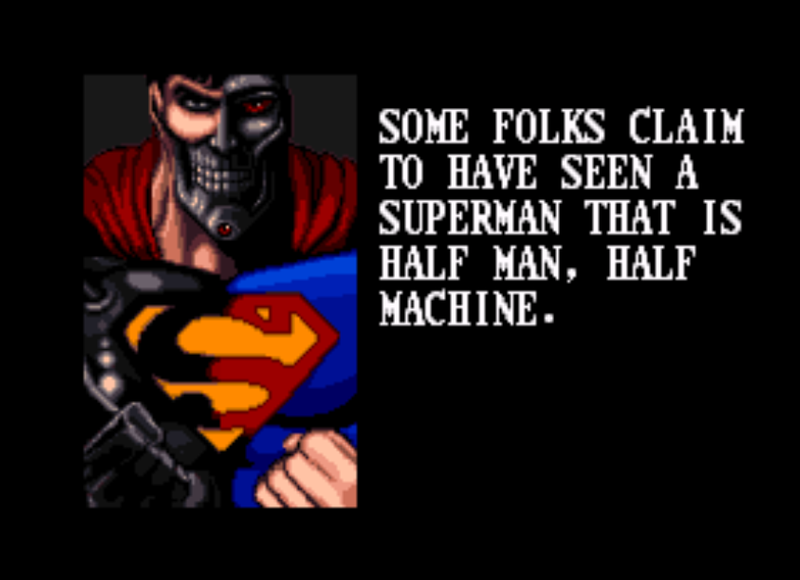 Being able to unlock a de-powered, machine gun wielding black-suit Superman would've really made it worth beating the game the first time — instead we're treated to a "good job, dude". In short, there's really no reason to return to this game unless you get a sudden pang of nostalgia. 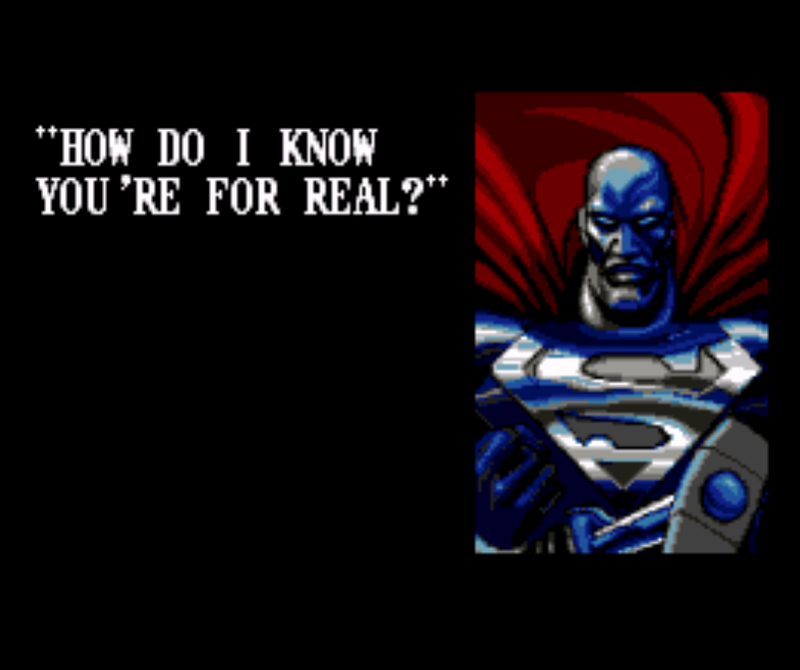 The game wasn't extremely faithful to the comic book story arc, and just kept the 'bare basic' story elements. 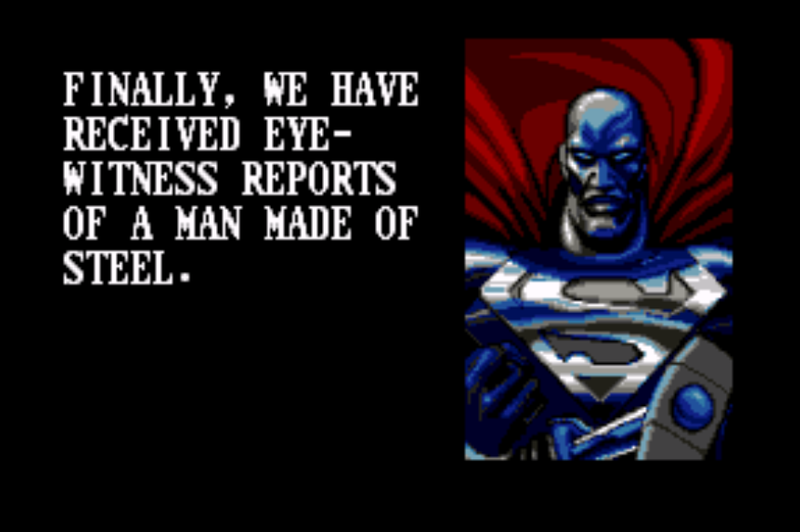 I don't know how video game/comic book licenses work (maybe Blizzard Entertainment only had permission from DC comics to use Reign of the Supermen characters, and not the Justice League nor the Green Lantern characters? Was somebody else holding the video game rights to these characters in the early 90s?) but there quite a few notable characters omitted from this game. 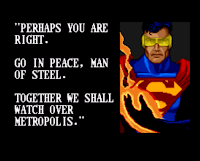 No mention of Matrix/Supergirl, no mention of Professor Hamilton or Bibbo, no mention of the Guardian (Jim Harper) nor the Newsboy Legion, and no mention of Mongul — these were the other "secondary players" in the Death and Return of Superman story line — it would've been a nice attention to detail to include them. I'm not sure why Blizzard Entertainment would neglect to mention anything about the Justice League of America, since they released ANOTHER DC Comics console the very next year [i.e., Justice League Task Force]. 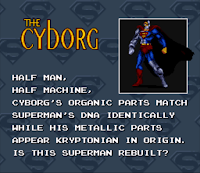 Digitizing and programming new non-playable characters takes time, which Blizzard may not have had very much of if they were trying to release this game in order to capitalize on the 'Death and Return of Superman hype' generate by the comic book story arc. I'm not really sure what to make of Wyatt's comment. 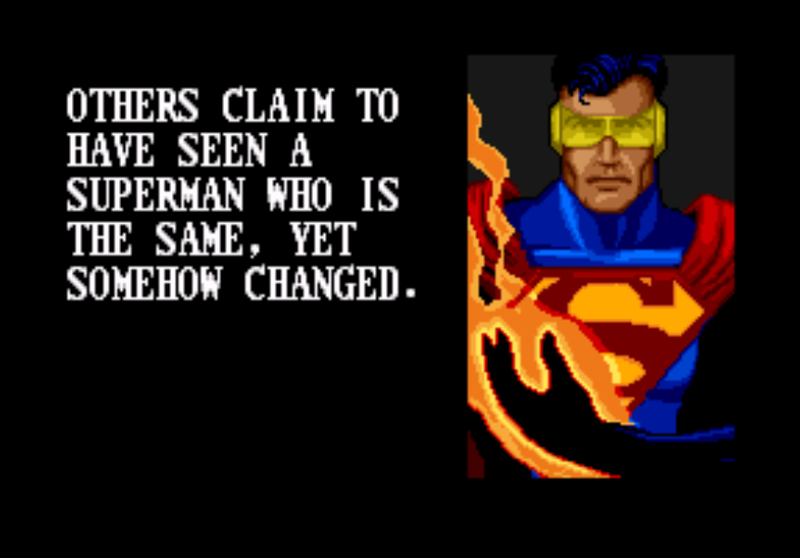 Is he stating that the DC Comics licensing department had a heavy hand on which elements/characters were included in the game? 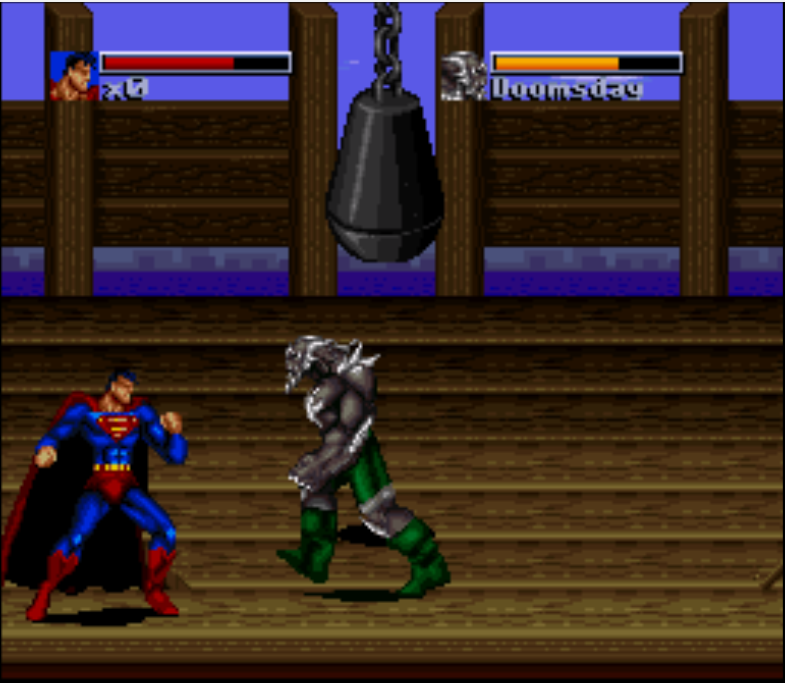 Or did Blizzard have radical ideas of what the game should be like, and the DC licensing dept 'kept them honest' to the story line? Only Wyatt knows for sure. What's curious about this very mediocre game is that Nintendo named Blizzard Entertainment as 'developer of the year' in 1993. 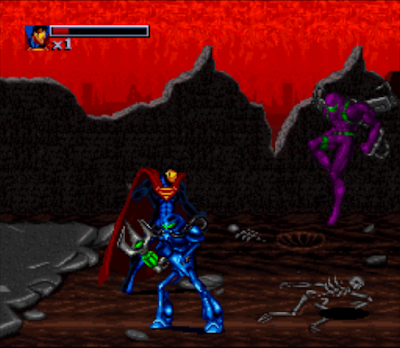 This was a result of 1992's The Lost Vikings and 1993's Rock N'Roll Racing for the SNES, and the critical acclaim both games had garnered for the video game developing company. 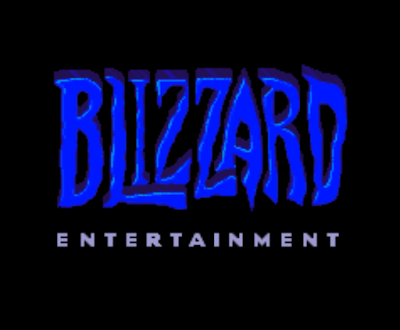 (Blizzard Entertainment was known as Silicone & Synapse when they released the two aforementioned games.) 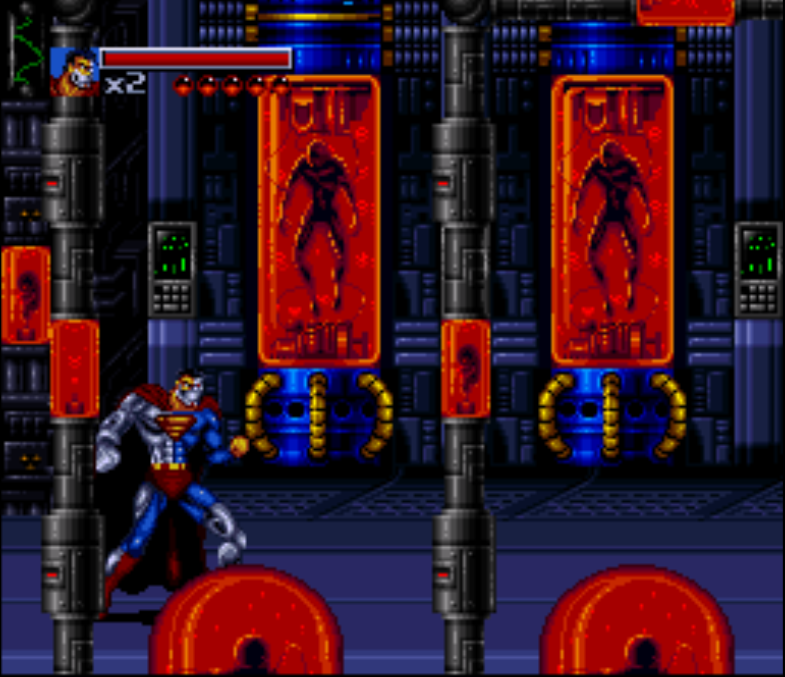 Blizzard's Blackthorne for the SNES, also released the same year as Death and Return of Superman, received a very good reception from audiences and video game review magazines alike. One wild theory that I like to entertain is that Death and Return of Superman was rushed out the door as quickly as possible because it was a'stepping stone' in Blizzard's real goal of getting enough development money for the REAL game they wanted to create: 1994's Warcraft: Orcs & Humans. "The team was thinly staffed because the development of Warcraft was self-funded by the company from revenues received for developing titles for game publishers like Interplay and SunSoft, and the company coffers were not deep." 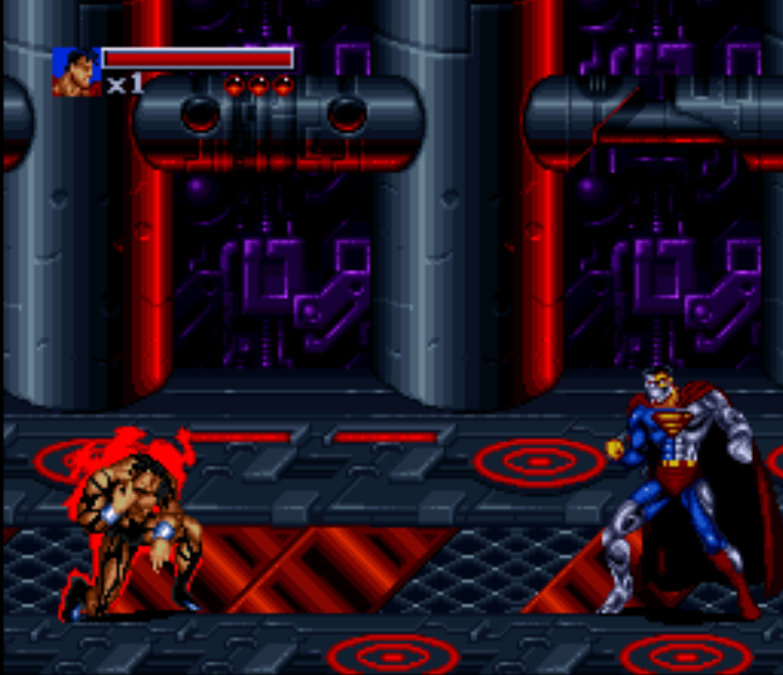 "At that time we were developing four 16-bit console titles: The Lost Vikings 2 (the sequel to our critically-acclaimed but low-selling, side-scrolling “run-and-jump” puzzle game), Blackthorne (a side-scrolling “run-and-jump” game where the lead character gets busy with a shotgun), Justice League Task Force (a Street Fighter clone set in the DC Comics universe), and Death and Return of Superman (a side-scrolling beat-em-up based on the DC universe& comic series of the same name)." "With the money received for developing these games and other odd jobs the company was able to pay initial development costs." A lawyer might call that conjecture, which is perfectly fine, because that's what it is. That being said, I've never created a game before, and if I did, I doubt it would look and play a fraction as good as this — so I'm hesitant to call this game a waste of time. 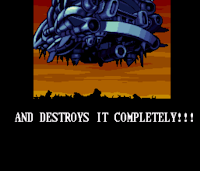 Truth be told, when I wasn't cursing to the heavens about losing my last life in the end-level boss battle, I was having a pretty entertaining time. It's a challenging game and I always kept coming back for more. However, having done it and completed it, I don't plan on ever revisiting it. 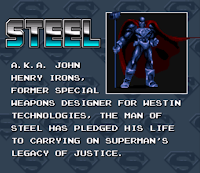 This is also one of the few opportunities for a John Henry Irons fan to play as the Man of Steel in a side-scrolling video game (or a Superboy fan, or an Eradicator fan, or a Cyborg Superman fan... you get the picture), so that can't be dismissed. I don't have any records of sale data, but I do know that a sealed copy of the SEGA version of this game goes for quite a few dollars in the UK... but that's more due to a supply-and-demand thing and not because people are knocking down doors trying to get a copy of this game.